A delicious Gazpacho soup is a great way to harvest the value of tomatoes! Do you know the difference between a Thriving Practice and a Struggling one? Edison Institute of Nutrition graduate Tamer Solomon and how he is changing lives! Emotions & Health – Are they related? Growing your nutrition practice: Do I need a mentor? How Can I Earn a Degree in Homeopathic Medicine? How Do I Set Goals for My Nutrition Practice? 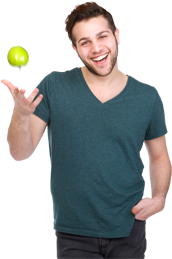 How to use Edison’s Institute’s Distance Learning to further your career in Nutrition? Oil Pulling – What is that all about? Our top 3 faves for digestion! Studying Nutrition in 2016: How Can I Excel in My Studies? THE FLU SHOT OR NOT? What are they Key Courses Required to Become a Holistic Nutritionist? Why Are Monkeys So Happy?